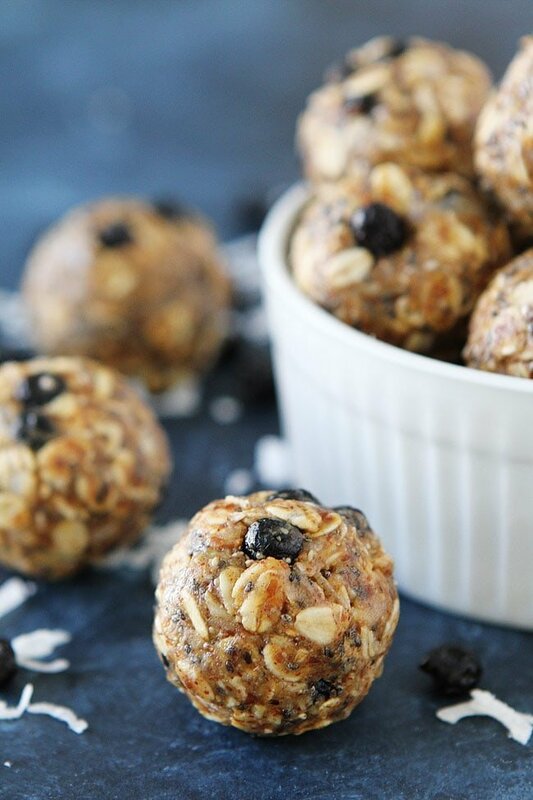 Blueberry Coconut Energy Bites are a healthy on the go snack that only take 10 minutes to make! 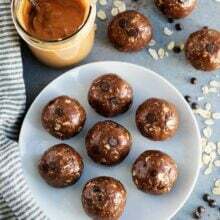 Kids and adults love these little no-bake energy balls! 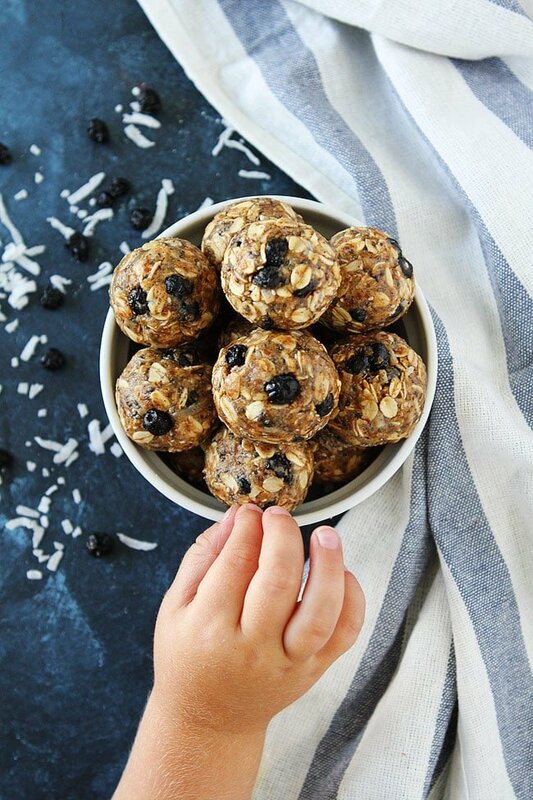 We are currently loving these Blueberry Coconut Energy Bites. 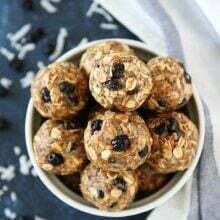 The no-bake energy bites only take 10 minutes to make and they hit the spot every time. The blueberry coconut combo is a WINNER! You can find dried blueberries at most grocery stores, just look in the aisle with the raisins and other dried fruit. You might have luck in the bulk bin section too! 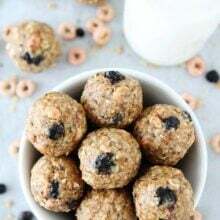 If you need the energy bites to be gluten-free, you can use gluten free oats. I like to stir in a little coconut extract to bring out the coconut flavor, but if you don’t have it on hand, you can skip it, they will still be good! You can mix the energy bites up in 10 minutes. It is a super kid friendly recipe so let the kids help roll the mixture into balls. 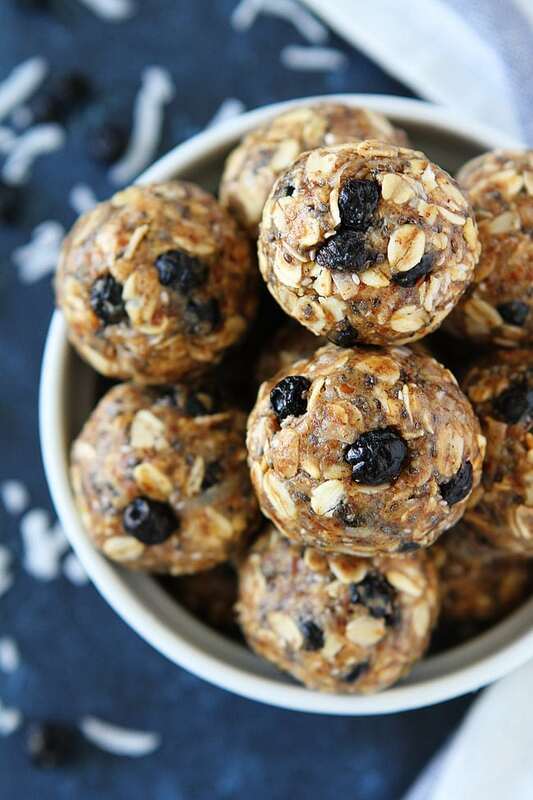 The next time you need a little snack, make Blueberry Coconut Energy Bites. They are a great healthy treat! You can keep them in the fridge for up to two weeks or you can keep a stash in the freezer for up to a month. FYI-they really come in handy at 9 pm when you NEED something sweet. 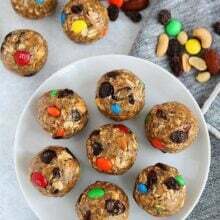 These easy no-bake energy bites are a great healthy snack for kids and adults! 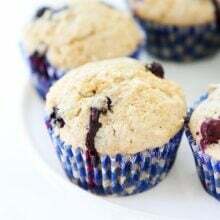 The dried blueberries and coconut add the perfect sweet kick! In a large bowl, combine oats, ground flaxseed, chia seeds, cinnamon, and salt. Place the almond butter in a small microwave safe bowl. Heat in the microwave for 20-30 seconds or until slightly melted. Stir until smooth. Add the honey, vanilla, and coconut extract, if using, to the melted almond butter. Stir until smooth. Pour over the oat mixture and stir until well combined. Stir in the dried blueberries and coconut. Roll the mixture into small balls, about 1-2 tablespoons per ball. Place in an airtight container and keep refrigerated for up to 2 weeks. You can also keep the balls in the freezer for up to 1 month. I made a similar thing recently and they were a big hit with the kids, maybe I’ll have my daughter make these!! These are my kind of healthy snacks! So perfect for the afternoon slump! Any substitute for the almond butter?? We have nut allergies?? I followed the recipe but they ended up super crumbly like I couldn’t form a ball. Any tips? What brand of almond butter did you use? Did you try chilling them? You could add some melted coconut oil. I’ve never had them turn out crumbly. Sorry! Awwww, the baby’s hand in the shot is adorable! Your photography is really pretty and this recipe looks amazing! I love energy bites but I’ve never made them with dried blueberries before! I can’t wait to try these! LOVE this idea! Do you happen to have the nutritional information breakdown on this recipe? It would be very helpful for those of us who are closely watching our food intake…Thanks!! Is it ok to exclude the coconut flakes? I’m not a fan of coconut. Can you taste it? These were a huge hit at the office holiday cookie party. Would you happen to know an estimate of the macros?